Get the right voltage label for a price that can't be beat! 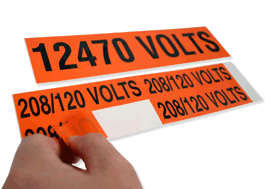 Our broad range of sizes and legend for Voltage and Electrical marking come in bold orange vinyl labels, in sheets or books. These safety labels help to communicate workplace and worksite electrical hazards like static, grounding, and voltage and shock hazards. Take a look at our wide variety of sizes, messages, and materials to get a safety message that really stands out. • Durable, pressure-sensitive vinyl markers are versatile enough to adhere to most surfaces. • Snap-On Voltage Markers are perfect for cables and conduits. • For great on-the-go marking, our convenient label books prevent waste and offer simple storage. • Take a look at our most popular voltage labels below, or try our voltage marker books and handy snap-on pipe markers! 80¢ per card when you order 100!